Nassau, The Bahamas - The Over-the-Hill Community Development Partnership Initiative received a donation from Albany Bahamas of $300,000 for the redevelopment of historic Southern Recreation Grounds. The presentation took place during a press conference on Monday, November 5, 2018 at the Office of the Prime Minister, Cecil Wallace-Whitfield Centre. It’s half of a total of $600,000 pledged. On hand for the presentation were: Dr. the Most Hon. Hubert A. Minnis, Prime Minister; Dr. Tyrone McKenzie, Sr. Vice-President, Albany Bahamas; Permanent Secretary in the Office of the Prime Minister, Nicole Miller-Campbell; Samita Ferguson, Executive Manager of the Over-the-Hill Unit; other personnel charged with executing the Over-the-Hill Community Development Partnership Initiative, Office of the Prime Minister; and Viana Gardiner, Chief Operating Officer, Prime Minister’s Delivery Unit, Office of the Prime Minister. The redevelopment project is part of the government’s comprehensive Over-the-Hill Community Development Partnership Initiative. The Over-the-Hill Community Development Partnership Initiative focuses on reducing crime, cleaning up and rejuvenating the area, and community social and economic development Over-the-Hill. The renovation of the Archdeacon William Edward Thompson Softball Field on the Grounds will soon begin. There will be new playground equipment and adult exercise equipment. The basketball court will be resurfaced and other improvements will be made. The installation of the new equipment is part of the government’s various healthy lifestyles initiatives to reduce the incidence of non-communicable diseases through better nutrition and physical activity and exercise. The redevelopment and restoration will also include informative signage to depict the role the Grounds played in the development of our nation's history. The Prime Minister said he was happy one of the priority items for rejuvenation of the Over-the-Hill Community is being realized. 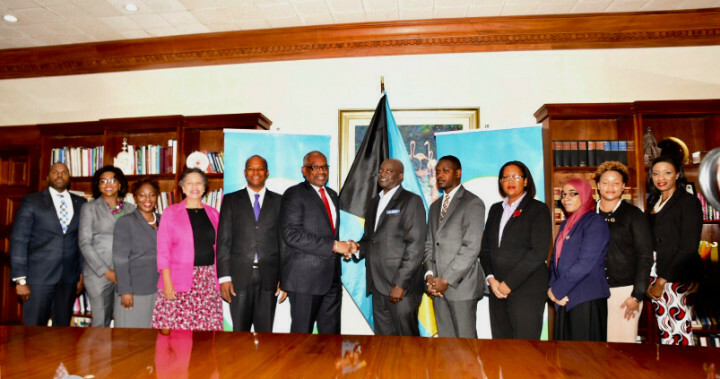 He thanked Albany Bahamas for partnering with the government in its initiative to redevelop such an iconic historical and cultural venue, and for Albany’s continuing to be a generous corporate citizen. The Prime Minister also noted the historical political and social significance of the Grounds. By restoring the Southern Recreation Grounds, the government hopes to reinvigorate commitment to national pride, he said. The Prime Minister confirmed that qualified residents within the area would be hired to work on the project before Christmas. A groundbreaking ceremony is to be held soon. The second tranche of the donation for the initiative, the amount of an additional $300,000, will be made in coming months. The Southern Recreation Grounds are located just below Government House – situated between Blue Hill Road and Market Street.